Beware rocks that Republicans will be looking under at the confirmation hearings for President Obama’s Commerce Secretary-designee. For those who’ve been waiting for Barack Obama, unfettered from the constraints of re-election, to emerge from his chrysalis and take wing as the true liberal they have always known he was, well, here we are: a proposal to cut Social Security benefits via a cost-of-living adjustments (candidate Obama in 2008 said John McCain suggests “the best answer for the growing pressures on Social Security might be cost-of-living adjustments or raise the retirement age. Let me be clear: I will not do either.”) And now this. 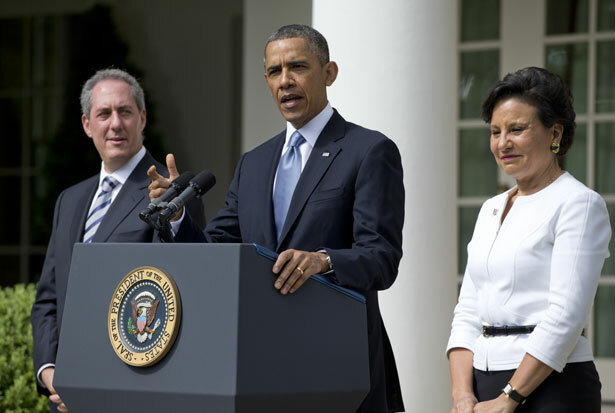 In December of 2008, Obama’s choice for Secretary of Commerce, Chicago-based business tycoon Penny Pritzker, withdrew her name from consideration in the face of a triple-barreled onslaught. First, there was her position on the board of Superior Bank, which her family bought with the help of $645 million in tax credits for the federal government. In 2001, Superior collapsed after pioneering the bottom-feeding trade in subprime mortgages. In In These Times, David Moberg called it a “mini-Enron scandal”; 1,406 uninsured depositors lost their savings. Here was what one of the victims had to say: “The Pritzkers are crooks. They don’t care anything about people who spent their whole lives trying to save.” And here is how Penny responded: “We had seven years of clean audits and then the auditors said, ‘Well, maybe we’ll change the way we calculate.’ ” Exquisite humanity, that. The family coughed up $435 million in settlement money in exchange for not having to admit any wrongdoing. But why, Penny was asked, would they pay half a billion dollars to clean up a mess she said was none of their fault? Because, she answered, “My family is not going to litigate with the federal government at a time like this”—a reference to the September 11 attacks; classy. Since that near-nomination, Chicago’s new mayor, Rahm Emanuel, chose Penny Pritzker to join the mayor-appointed school board—a body, as I’ve been documenting here, that has fanatically devoted to breaking the Chicago Teachers Union, and turning over the system to charter school operators. Their excuse has been the school system’s alleged $500 million deficit. Which is where Penny comes in. For while the city’s budget for schools is alleged to be bare, the city’s tax increment financing (TIF) fund, a slush pile for rich developers, carries a surplus of at least $500 million. What does this have to do with Penny Pritzker? Well, as it happens, on my very street, she is building a Hyatt financed with $5.2 million in TIF funds. As the Chicago Teachers Union points out, the TIF fund is controlled personally by the mayor; members of the school board (from which Pritzker recently resigned ahead of her Commerce appointment), overwhelmingly his rich campaign backers, are personally appointed by the mayor; and nothing’s keeping them from leaning on the mayor to tap the TIF surplus to plug the school deficit—except the fact that this very deficit is the rhetorical foundation for all the things they’re doing to weaken the union. All in all, Penny Pritzker’s relationship with labor has become exponentially worse since her near-nomination in 2008. So how has second-term Obama responded? By renominating her. It should make for some interesting confirmation hearings. This family is famously secretive. In 2003 two family scions, siblings Liesel and Matthew Pritzker, sued their father Robert Pritzker for $6 billion, claiming he had looted their trust fund. In 2004, a judge gave them access to sealed financial reports. Explained investigating reporter Gus Russo, “that unearthed a secret family deal cut after Liesel’s uncle Jay Pritzker’s death in 1999, a plan that would have broken up the fortune into eleven shares valued at $1.4 billion each. In early 2005, rather than expose the complicated Pritzker offshore shelters to the light of day, the Pritzker family put the final touches on a private settlement agreement” giving Liesel and Matthew Pritzker upwards of $500 million each to drop the case. Which is how these cats tend to do business: cash in exchange for quiet. In 1982, for instance, when The Kansas City Times published an investigation of family finances after the collapse of a skywalk at a Kansas City Hyatt killed 114, they discovered that the family’s casino purchases beginning in 1959 were funded by $54 million in loans from the notorious mob-connected Teamsters Pension Fund, without telling stockholders as the law required. (The family agreed to a consent decree that allowed them to neither admit nor deny the allegations—shades of Superior Bank). The paper also quoted an IRS informant, a vice president of the offshore bank where the family stashed their cash: “The Pritzker family of Chicago through their Hyatt Corp. initially received their backing from organized crime.” According to the reporter who won a Pulitzer for the series, Knut Royce, Jay Pritzker’s initial response was to try to buy the newspaper. Failing that, he arranged a private takeover of Hyatt, the family’s one company that has ever been public, so it never would have to file information with the Securities ad Exchange Commission again. If Republican senators have any strategic sense, they’ll be asking in open hearings about this sort of stuff: how the Pritzkers came by all those billions in the first place, how they’ve kept it from the view of the public and the taxman both, and what it is they’ve been so eager to hide. I’ll have more to say about that tomorrow. To put it lightly: It’s not the kind of thing Barack Obama needs America to hear about one of his cabinet appointees. Read Rick Perlstein on pyramid schemes and the right.